The sustainability of being an athlete in any state is the cornerstone of encouraging a culture of sports. 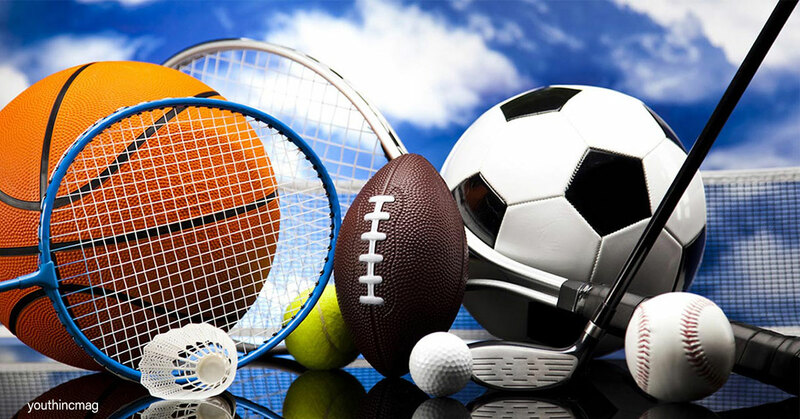 If being a sportsperson comes with the securities available in other sectors – in terms of income, pension, job assurances, and other means of social welfare – then the likelihood of talented people devoting themselves to their sport is far higher. While Haryana does have an elaborate set of policies devoted to supporting state athletes, evidence shows that there is a lack of effective implementation. The growth of a framework guaranteeing jobs to athletes in Haryana, formally established in 2016, has been an ongoing process. The state government offers jobs to sportspersons based on merit, i.e., the more qualified an athlete – in terms of participation in competitions (for instance, one has to participate in over 20 percent of the annual number of competitions in order to be eligible for employment), medals won, and the level at which they have competed – the more respected the job, and higher the salary. As of 2016, a 3 percent reservation was introduced in C and D grade government jobs – ranging from Deputy Superintendent to security guard. A higher grade corresponds to better-paying employment options. Table 1 below elucidates the jobs available to athletes, and the associated criteria (compiled using information from the Department of Sports and Youth Affairs, Government of Haryana, 2016). However, while the official structure seems to be in place, the implementation of the policies listed in Table 1 lag severely. For instance, athletes routinely express how their hard work goes unrewarded, after the initial publicity and attention from government officials. Consider Sakshi Malik, India’s wrestling Olympic medallist, who took to social media platforms to highlight the inactivity of the Haryana Government in fulfilling its promises (Hindustan Times, 2017). The article also highlighted how the promises of a job for a wrestling director at the Maharishi Dayanand University in Rohtak was pending (ibid.). Similarly, Geeta Phogat, India’s CWG wrestling champion, was bereft of her promised job for nearly six years, until she was finally made Deputy Superintendent of Police (Aggarwal, 2016). Haryana offers the highest cash incentives to athletes in the country (Goyal, 2018), and it is also one of the only states that does not discriminate against para-athletes with regard to monetary rewards. 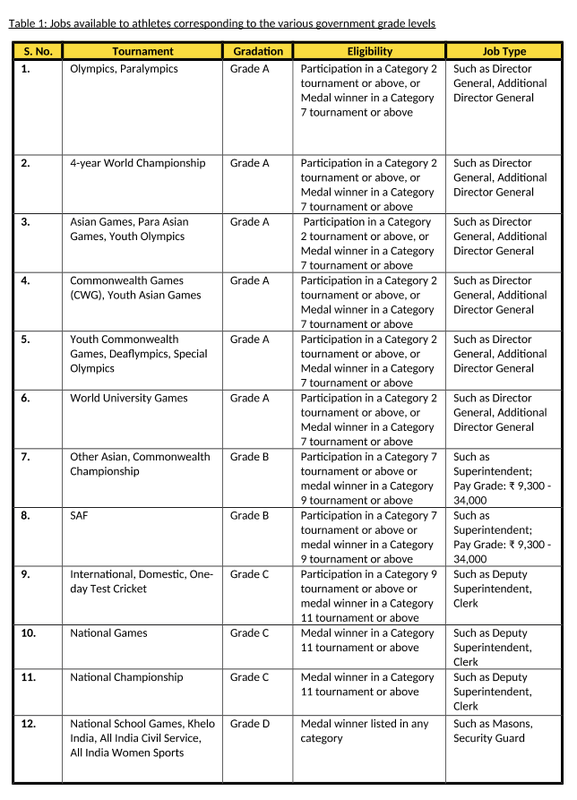 In Table 2 below, cash incentives offered to athletes in international and national level competitions are presented (Tribune India, 2018). As of June 2018, the Haryana government issued a controversial notice to athletes asking them to deposit one-third of their income from tournaments (and related endorsements) to the Haryana State Sports Council (Times of India, 2018). The said amount is claimed to be used for sports development in the state. Several ‘celebrity’ athletes, such as Yogeshwar Dutt, have severely criticised this decision. He claims that the government is contributing heavily towards the decline of Haryana’s robust sporting culture (ibid.). In addition, the prize money won in inter-organisational competitions by athletes representing other organisations (such as the railways) will be deducted from the prize money awarded for national and international competitions. These policies have faced extreme backlash, and have therefore been momentarily suspended – ‘[the] contribution toward the growth of sports in Haryana is zero… but they [the government] are 100 percent succeeding in its decline’ (Times of India, 2018). In summary, although the cash incentives promised are substantial, they remain undelivered. What is delivered, instead, are income-reducing measures, which have caused substantial friction within the sporting community to the extent that the government had to cancel a felicitation ceremony for CWG 2018 medal winners, after athletes threatened to boycott the ceremony (ibid.). Creating a sports calendar to formalise a structure of sports competitions at every level of administration was promised by the government, for both regular and indigenous sports. Apart from annual knockout tournaments at higher levels, the league format was proposed to be specially introduced for running competitions throughout the year at the local level. The league format increases the number of matches manifold, while still being extremely cost-effective for the organisers, as the teams bear the small logistical costs of bilateral visits (Department of Sports and Youth Affairs, Government of Haryana, 2016). The high number of matches sustains interest in the sport at the grassroots level, as well as provides more opportunities for competitors from all backgrounds to exhibit their talent. Furthermore, these competitions come with cash incentives. Table 3 below shows the rise in cash incentives in a state level Akhada (or wrestling) competition, arguably one of Haryana’s most popular sports (ibid.). Although the league format is a potent way of attracting new talent, the fact that it is the team or competitor who bears the cost of participating is likely to discourage talented, but less privileged members of society. There are also numerous additional costs which are not included in the competition costs, such as housing, transport, medical costs, etc. Moreover, the facilities to hold these competitions, and to train for them are practically non-existent; merely 15 percent of the total number of training grounds or Vyayamshalas have been built (Bhaskar Report, Dainik Bhaskar, 2018). There was one poorly equipped and over-capacity government hostel for athletes in Gurugram, and that too was shut shortly after (Kumar, 2017). The 2015 sports policy also proposes several other types of competitions, many of which are now a reality, such as the Chief Minister’s Trophy or the Haryana Premier League for Cricket (Department of Sports and Youth Affairs, Government of Haryana, 2016). However, these competitions suffer from a history of being embroiled in controversy. The Board of Control for Cricket in India (BCCI) and other sport authorities are working toward banning such ‘unauthorised’ leagues as they are rife with ‘gross irregularities, alleged betting and match-fixing’ (Ali, 2017). Famous sportspersons are beginning to disassociate themselves from such leagues, resulting in their inevitable downfall (ibid.). As these examples elucidate, policies regarding competitions are wholesome and worthwhile on paper. However, they suffer from several drawbacks on the ground and lack severely regarding implementation. Therefore, it must be noted that, although the government policies indicate sports as being a viable career option for athletes in Haryana, implementational challenges mire these well-intentioned objectives. Sporting talent in Haryana is ubiquitous. The percentage of medals brought in by the state for the nation is unparalleled. The endeavour of channelising the existing talent better, and providing appropriate measures for aspiring athletes will ensure an even more promising future for not only athletes in Haryana, but for the rest of the country as well. Aggarwal, S. (2016). After Six-Year Wait, Wrestler Geeta Phogat Finally Appointed DSP. [online] The Quint. Available at: https://www.thequint.com/sports/after-moving-the-high-court-geeta-phogat-appointed-deputy-superintendent-of-police-six-years-too-late-wrestling- [Accessed 2 Oct. 2018]. Ali, Q. (2017). On A Board: No Permit To Rebels. [online] https://www.outlookindia.com/. Available at: https://www.outlookindia.com/magazine/story/on-a-board-no-permit-to-rebels/299486 [Accessed 2 Oct. 2018]. Danik Bhaskar (2018). CM Khattar Inaugurated Gym Not Completed in Three Years. [online] Bhaskar Report. Available at: https://www.bhaskar.com/harayana/panipat/news/cm-khattar-inaugurated-gym-not-completed-in-three-years-5867248.html [Accessed 2 Oct. 2018]. Department of Sports and Youth Affairs (2016). Explanatory Memorandum of the Schemes of the Sports Department. Government of Haryana. Goyal, P. (2018). How is Haryana winning all the medals? The answer lies in history and incentives. [online] ThePrint. Available at: https://theprint.in/sport/how-does-haryana-top-indias-medal-tallies-the-answer-lies-in-history-and-incentives/113803/ [Accessed 2 Oct. 2018]. https://www.hindustantimes.com/. (2017). Sakshi Malik, Haryana govt spar over Olympics rewards: Fact check on 5 promises. [online] Available at: https://www.hindustantimes.com/india-news/sakshi-malik-haryana-govt-spar-over-olympics-rewards-fact-check-on-5-promises/story-VsdWbE82txEb9O4RXLNZbJ.html [Accessed 2 Oct. 2018]. Kumar, A. (2017). Haryana making sportspersons sweat. [online] The Hindu. Available at: https://www.thehindu.com/news/cities/Delhi/haryana-making-sportspersons-sweat/article20946221.ece [Accessed 2 Oct. 2018]. Manav, S. (2018). Govt changes cash award criteria for sportspersons. [online] Tribuneindia News Service. Available at: https://www.tribuneindia.com/news/haryana/govt-changes-cash-award-criteria-for-sportspersons/617828.html [Accessed 2 Oct. 2018]. The Times of India. (2018). Haryana govt asks athletes to deposit one-third of their income to state – Times of India. [online] Available at: https://timesofindia.indiatimes.com/sports/more-sports/others/haryana-govt-asks-athletes-to-deposit-one-third-of-their-income-to-state/articleshow/64505857.cms [Accessed 3 Oct. 2018].